Put oven rack in upper third of oven and preheat oven to 450 F.
Line 2 shallow baking sheet with tin foil, and place in oven. 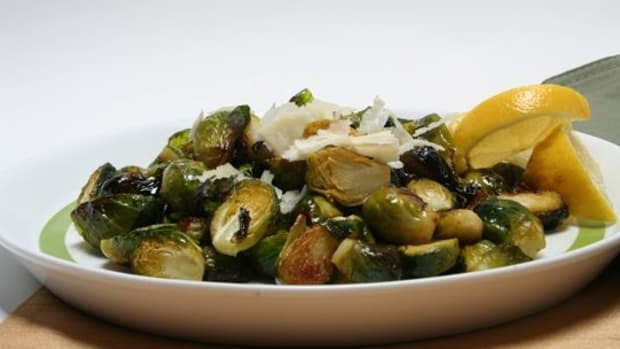 Toss Brussels sprouts with olive oil, maple syrup, garlic, salt, and pepper. Remove hot pans from the oven (caution! 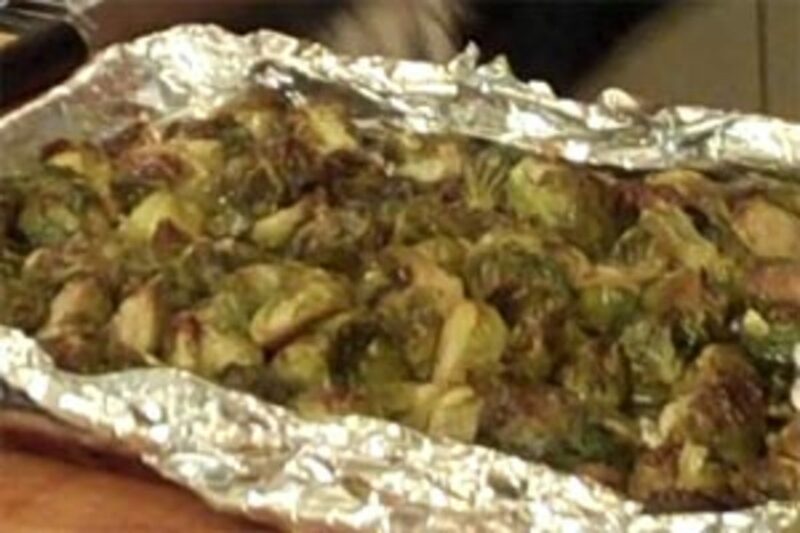 they will be hot) and spread out Brussels Sprouts in 1 layer in shallow baking sheets. You should hear it a sizzle when the Brussels Sprouts touch the pan, then you know the pan is hot enough. 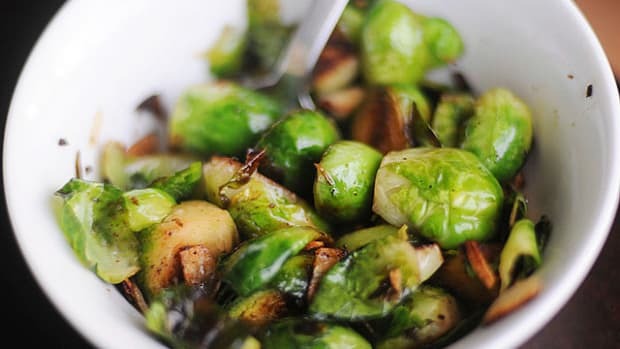 Working with hot pans will help brown and crisp the Brussels sprout. Roast, stirring occasionally and switching position of pans halfway through roasting, until tender, browned, and a little crispy about, 25 to 35 minutes. Heat oil in a 10-inch heavy skillet over moderate heat until temperature reaches 250 F (see cooks&apos; note below), then fry shallots in 3 batches, until golden brown, 3 to 5 minutes per batch (watch closely, stir occasionally, shallots burn easily). Quickly transfer with a slotted spoon to paper towels to drain, spreading in a single layer. (Shallots will crisp as they cool.). Pour off oil from skillet (wait to clean pan until completely cool). Heat 5 tablespoons butter in skillet over moderately high heat until foam subsides, then sauté mushrooms, stirring occasionally, until golden brown and tender, about 7 minutes. Add wine, thyme, marjoram, salt, and pepper and simmer, uncovered, stirring occasionally, until liquid is reduced to a glaze, about 2 minutes. Add water (1/2 cup) and remaining tablespoon butter and simmer, swirling skillet, until butter is melted. Transfer to a serving dish and stir in Brussels sprouts. Sprinkle with some of shallots and serve with remaining shallots on the side. Shallots can be prepped 1 day ahead, cooled completely uncovered, and stored in an airtight container lined with paper towels kept at room temperature. 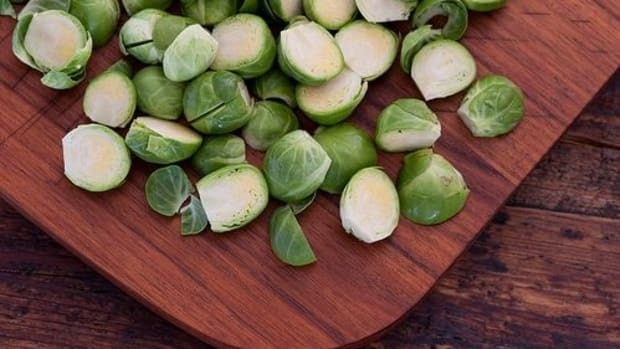 Brussels sprouts can cooked up to 5 hours ahead and cooled completely uncovered, then stored, loosely covered, at room temperature. 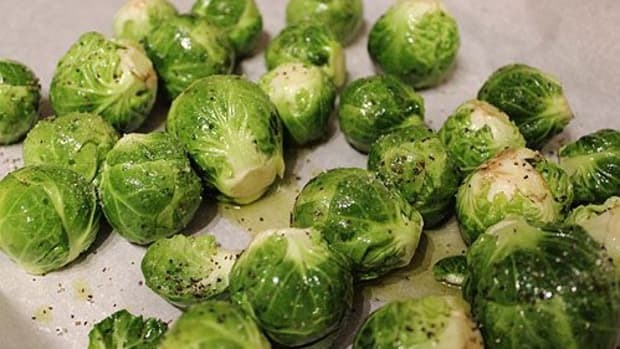 Reheat Brussels sprouts in a preheated 400 F oven and proceed with recipe. Mushrooms can be sautéed 1 hour ahead and kept in skillet, partially covered.